The Finals of the Men’s 4 x 100M Relay at the Rio Olympics makes a powerful case for believing that teamwork can outperform talent. The Japanese quartet did not have the personal and season best records of some of the high profile teams. Yet, the slick cohesiveness with which they moved the baton to the finish line earned them a Silver Medal ahead of individually more talented athletes. Having made the case for TEAMWORK, what are some of the keys to achieving Japanese-level team performance? 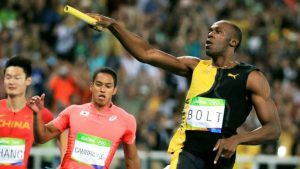 An essential factor in effective baton changing is that the speeds of the incoming and outgoing runners must be calibrated for a smooth exchange to take place. If the outgoing runner runs too fast he will run out of the prescribed zone before getting the baton. If he runs too slowly, the incoming runner is likely to bump into him. In order for the speeds to be calibrated, the relative speeds of the pair involved in the exchange needs to be assessed and the necessary adjustments made. We need to objectively evaluate the capabilities of team members whenever teamwork is required. This is not an exercise to focus on who is more competent or who adds more value. The objective is to see what needs to be done to use the existing capabilities to achieve the desired goals. How to make the best of what is available. The exercise should lead to the identification of areas for further strengthening and recognition of potential pitfalls. Showing respect for relative capabilities requires us to meet people where they are – not where we hope they would be. This realistic appraisal shields us from under-estimating the challenges ahead. Having respect for capabilities also points to the need to address demonstrable weak links. This takes courage and may produce conflict and disappointment. However, if your persistence in singing off key is going to get us voted off the show, then if we can’t fix it, you have to go. Each Japanese outgoing runner stuck out their hand and moved with the confidence that the baton will be lodged safely in their palm. We saw others making two grabs at the baton. That is disastrous in the high speed event. To develop high performing teams, the members must learn to trust each other and to live up to the confidence that has been placed in them. People have to do what is expected of them and we have to proceed on the basis that they will deliver. Second guessing, doubt and mistrust slow down the process and the competitive edge is lost. Let us stop dropping the trust baton. But also, commit to handing over our responsibilities as planned. Gymnasts, swimmers, runners, throwers and jumpers went through endless hours of preparation to get to Rio. They rehearsed repeatedly the routine and the form that would place them on the medal stand. If we are to sustain high performance in our teams, we need to identify the keys to our success and drill them into team members until they become second nature or part of “muscle memory”. This constant repetition of best practice is essential for success. Regular reference to easily understood measures of performance supports this process. Are we achieving our goals? Sustained high performing teamwork requires a winner’s mind-set. Team members are immersed in self-belief such that their very swag is off-putting to competitors. One team runs medal winning times in practice but messes up under pressure. Another struts around pre-race and delivers when it counts. A lot of that comes from mind-set and self-belief. Team leaders have the responsibility of instilling belief in members. Visualization is useful technique in developing a winner’s mind-set. Lie still, eyes closed and play mental videos of the successful achievement of your goals. Bring the scenes to life just as you did in your childhood. Rally, believe, celebrate, internalize. Now enrolling for the SHRM-credentialed “Certified Behavioral Coach” program.